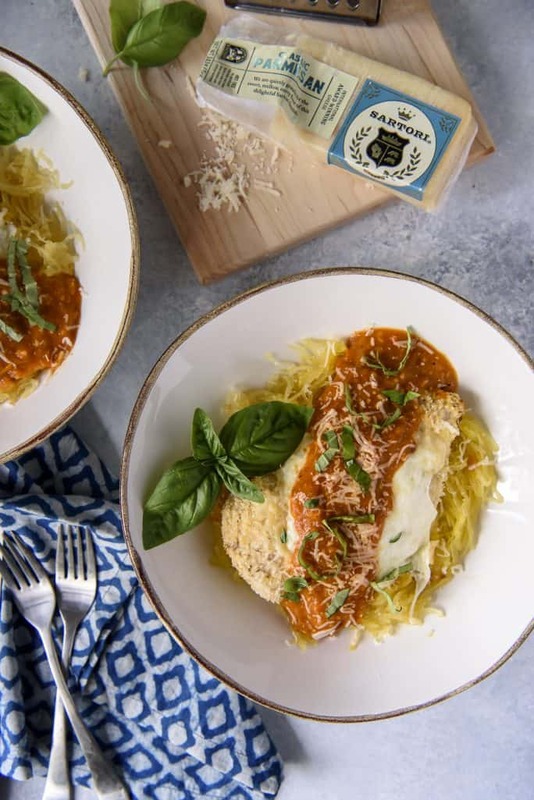 This moist, crispy, filling Baked Chicken Parmesan may be a lightened up Italian classic – but it doesn’t skimp on flavor! 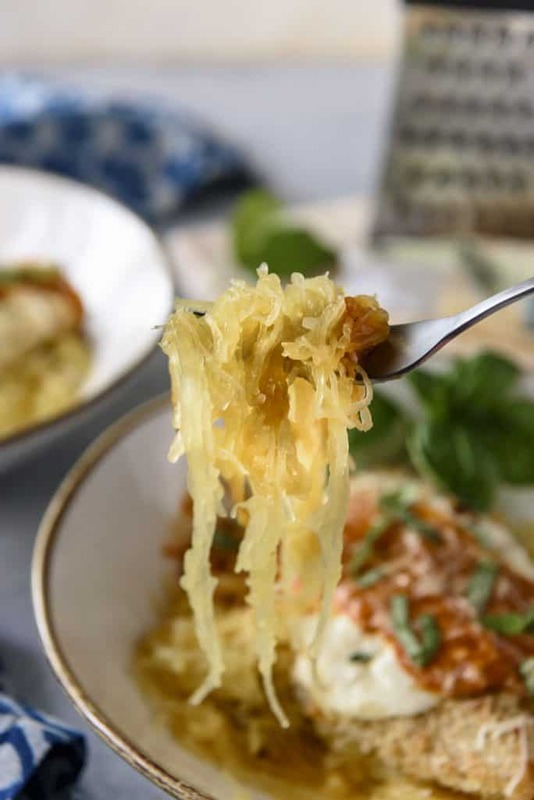 Serving it over steamed spaghetti squash instead of pasta also cuts those heavy carb-laden calories down to nearly nothing. Soooooo I figured after indulging in a ridiculously rich V-Day dinner with Abe, this baked chicken parm was just the lighter, healthier recipe we needed in our lives. And maybe it’s what you need in yours? It’s all about balance, people. A slab of chocolate cake today means salads and water tomorrow. Or something like that. 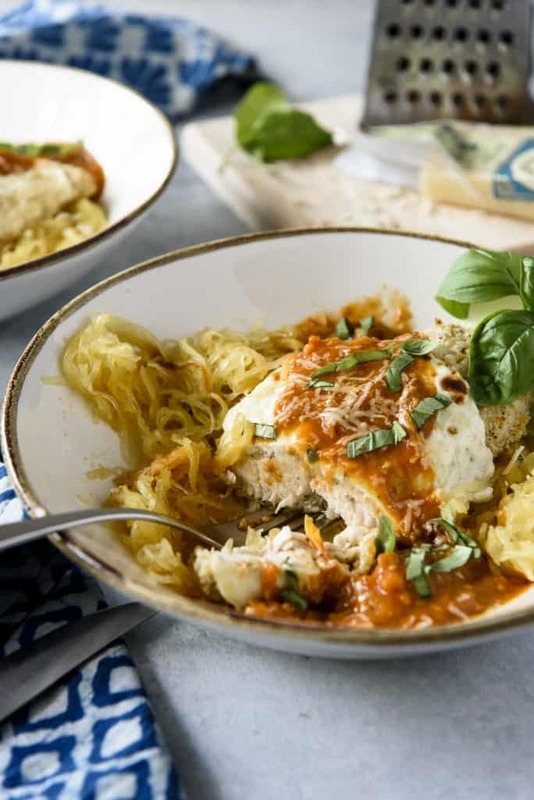 Baked Chicken Parmesan with Spaghetti Squash! This chicken parm recipe is one of those dependable dinners that you know will always satisfy. Chicken breasts full of protein, a little bit of crunchy breadcrumb topping, and cheese for days! Let’s be real…the cheese is the most important ingredient here. Fresh sliced mozzarella is my personal favorite, but shredded will be delish too, if that’s all you’ve got. And since it’s baked chicken parmesan, obviously a quality parm is in order. My go-to is Sartori’s classic parmesan cheese – it’s mellow and nutty and absolutely required in this dinner! • Bake your chicken and roast the tomatoes for your sauce at the same time! Create a separate ‘container’ for the tomatoes out of aluminum foil, toss them with some olive oil, salt, and pepper, and bake for 20 minutes. Top the chicken with cheese and bake for 10 more minutes – but not before removing the tomatoes. You can whip up the quick sauce while the cheese melts! 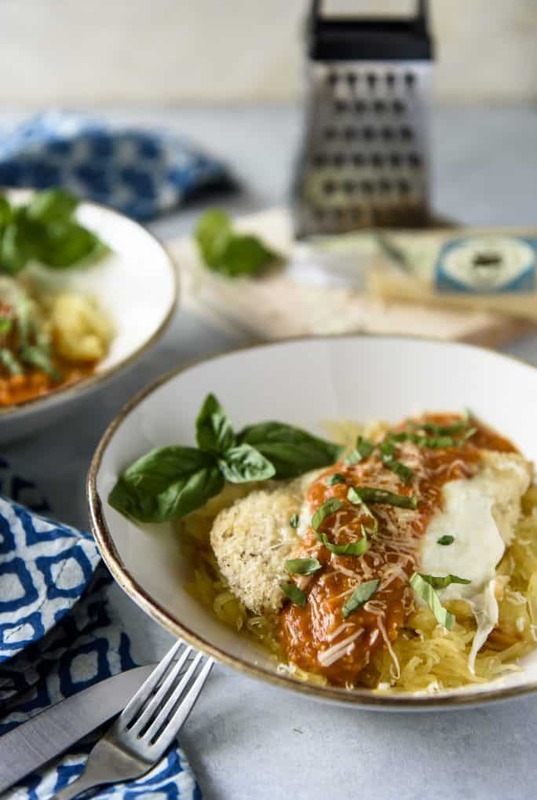 • For crispy crumbs, bake the chicken parm at 425 degrees F. You can also broil it with the cheese for a few minutes if you like it a little darker. • Make sure you split the breasts in half to create tenderloins! Not only will the chicken cook faster and more evenly, the flavors will taste better, also. Here are a few more baked dinner recipes that you’ll love! This moist, crispy, filling Baked Chicken Parmesan may be a lightened up Italian classic - but it doesn't skimp on flavor! 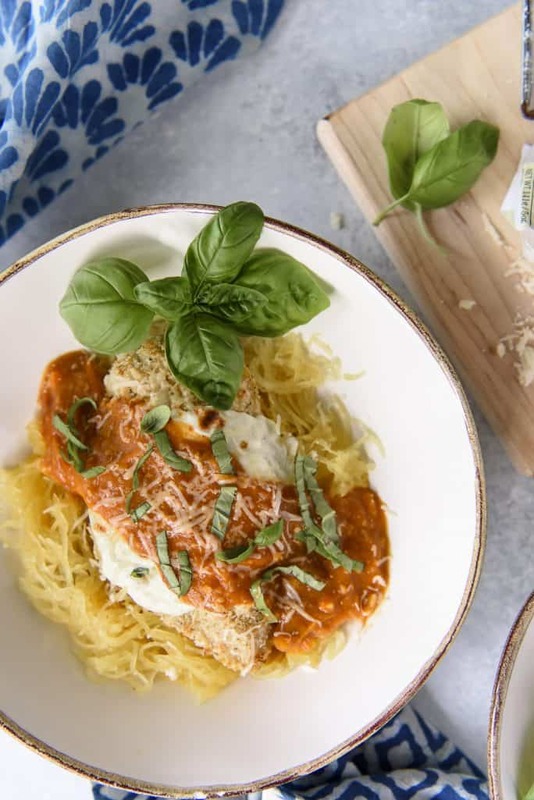 Serving it over steamed spaghetti squash instead of pasta also cuts those heavy carb-laden calories down to nearly nothing. Preheat oven to 400 degrees F. Line 2 baking sheets with aluminum foil and spritz lightly with an oil-based spray. Create an 8-inch diameter "bowl" out of a large piece of foil, folding up the sides about 1-inch high. Place it on half of one of the baking sheets; set aside. 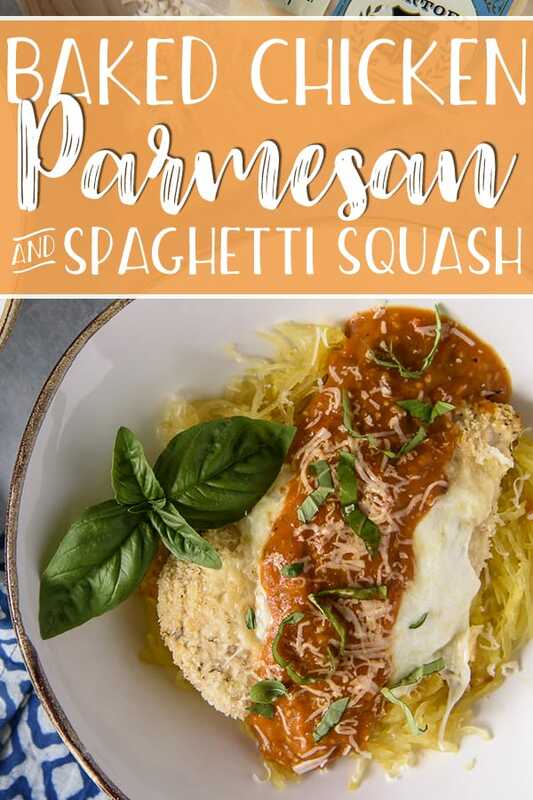 Carefully cut the spaghetti squash in half. Remove the seeds and discard, then lightly drizzle the squash flesh with 1 tablespoon of oil. Season with salt and pepper. Place the squash halves, cut side down, on one of the prepared pans. Bake for 20 minutes; meanwhile, prepare the chicken and tomatoes. In a bowl, combine the tomatoes, garlic, remaining oil, and salt and pepper to taste. Toss well, then transfer to the foil bowl. Combine breadcrumbs, 1/4 cup parmesan cheese, and herbs in a shallow bowl. Whisk the egg in another shallow bowl. Slice each chicken breast evenly in half horizontally, creating 4 tenderloins. Dip a piece of chicken into the egg, shaking off the excess, then dip into breadcrumb mixture. Place on the other half of the baking sheet, then repeat with the remaining chicken. Drizzle a little oil on top of the chicken, then place in the oven with the squash when it's 20 minute timer is up. Raise the temperature to 425 degrees F and bake for another 20 minutes, with the squash on the bottom rack of the oven. When the time is up, remove the pans from oven. Test the squash for doneness with a fork, returning it to the oven if necessary - otherwise, flip the halves with cut-side up so the flesh can cool. Carefully transfer the contents of the tomato bowl to a blender with the tomato paste. Pulse to blend to a smooth consistency. Taste and season with salt and pepper as desired. Top each chicken breast with a slice of mozzarella, then return the pan to the oven, baking 5-10 minutes until cheese is melted, or broiling on high for 4-5 minutes to brown it. Remove from oven and cool 2-3 minutes. Run a fork through the flesh of the squash to separate the “noodles." Divide them into bowls or plates, top with chicken, sauce, more grated parmesan, and basil. PIN THIS EASY BAKED CHICKEN PARMESAN RECIPE FOR LATER! 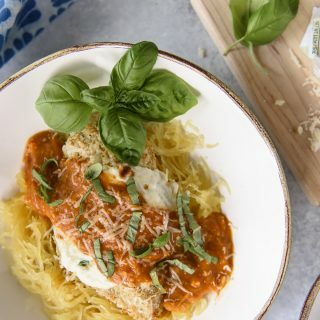 This healthier version of chicken parmesan is wonderful! Love the juicy chicken! 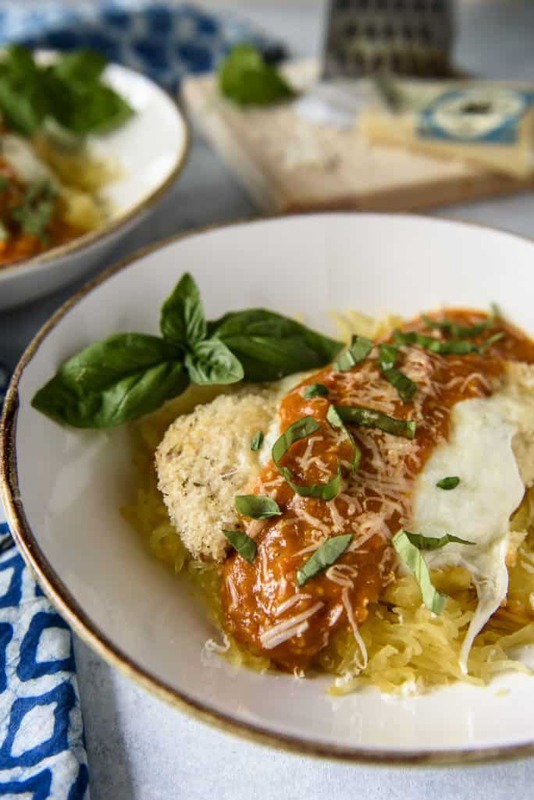 I love the idea of serving chicken parmesan with spaghetti squash! This looks amazing!